When Cone wrote "Black Theology and Black Power," he signaled to the world that the American black faith tradition would no longer recognize the confines of the church walls as the extent of its purview in society. Cone liberated the Gospel of Christ from its institutionalized forms, unhinging it from oppressive and racist power structures in American society and releasing it to do its work in the public sphere. "Black Faith and Public Talk" continues Cone's theme of power in the public realm and examines the economic, political, cultural, gender, and theological implications of black faith and black theology. 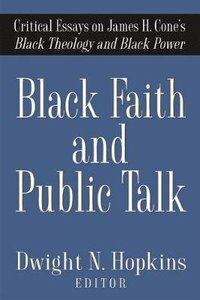 About "Black Faith and Public Talk: Critical Essays on James H. Cone's Black Theology and Black Power"
Dwight N. Hopkins is Professor of Theology at the University of Chicago Divinity School. He has published several books, which include Being Human: Race, Culture, and Religion (2005), Heart and Head: Black Theology Past, Present, and Future (2002) and Global Voices for Gender Justice (2001, co-editor with Ramathate Dolamo and Ana Maria Tepedino).